The original release of this game was a box set. Later printings were reformatted into one large staplebound paperback book, combining all the previously separate components. Regardless, the contents are the same either way. "It was a question of honor, and honor was always foremost in the minds of the men who strode through the age of the Sun King. A deserted courtyard on the edge of Paris was the stage on which they met with... 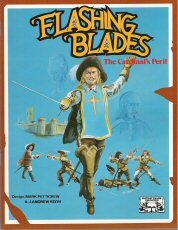 FLASHING BLADES. 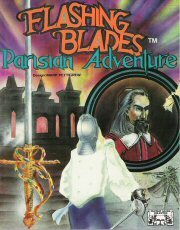 A complete role playing game set in the era of the Three Musketeers. A world in which a man's courage and ambition knew no bounds. It was a time of adventure and of intrigue in which the rival interests of King and Cardinal played a deadly game across France and all of Europe. Rules are included to cover character creation and skills, secrets and advantages, combat careers, economics, military campaigns and character involvement, politics and social standing. Detailed background sections provide a view of the political climate, laws, religion, customs, lifestyles, and a total 'feel' for the period. The introductory adventures are designed to demonstrate a wide variety of adventure styles possible within this popular genre as they deal with out-and-out combat, intrigue, international politics, and the social picture. Be prepared to be '...Born with the gift of laughter and the sense that the world was mad,' as was Scaramouche in Sabitini's novel. It's all for one and one for all as adventure and danger await just beyond the next bend in the road." • THE FENCING MASTER: A complete adventure involving fencing schools and their rivalries, as well as a rescue mission to the south of France. • THE GRAND THEATRE: A complete adventure built upon espionage and the influence of powerful figures, all compounded by the rivalry between King and Cardinal and between the King's Musketeers and the Cardinal's Guard. • THE GREAT MARKSMANSHIP TOURNAMENT: An adventure of pomp and ceremony during the official celebrations marking French military victories with subplots of intrigue and danger. • SCAVENGER HUNT: A humorous quest through the streets of Seventeenth Century Paris, interspersed with typical encounters in a major city. • EXOTIC ITEMS: A new section on exotic and interesting items that were becoming popular of fashionable in Paris during the Seventeenth Century. • A GUIDE TO PARIS: A view of Paris in the Seventeenth Century discussing major buildings and their functions, neighborhoods and backgrounds. • THE RUMORMILL: A source of rumors for any campaign to use as a starting point for many adventures or to add subplots of overall background to an adventure in progress." 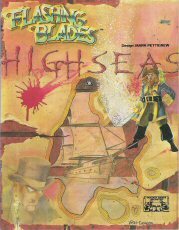 "An expansion for FLASHING BLADES to allow characters to adventure in the New World and at sea in the Caribbean (or elsewhere). Included herein are complete rules for the creation of colonial characters, new skills and backgrounds for the New World, a complete background to the New World and the colonial bureaucracy, colonial military campaigns, and even the position of he clergy in the Americas. Also included are complete rules for shipbuilding, ship types, sea travel and trade, and ship-to-ship combat. Additional sections provide a complete background to the world of pirates and privateers. • SCAVENGER'S DAUGHTER: An introductory adventure involving French-born characters sent from France to the New World on a perilous mission of importance for their monarch. • PIKE'S TROVE: An adventure wherein the pieces of a treasure map come together to lead to both riches and dangers. • GUEDE-JE-ROUGE: An adventure of rescue involving the beautiful daughter of a Colonial Governor and a voodoo curse. • PORTOBELO: An adventure of intrigue and espionage in a Spanish city on the Spanish Main wherein await potential rewards and perilous encounters." • A BRIEF HISTORY OF THE MUSKETEERS: An overview of the formation and history of the Musketeers (both the King's Musketeers and the Cardinal's Guard), including notes on their uniforms and organization. • THE CARDINAL'S PERIL: A complete adventure of disguise and intrigue set during the preparations for the siege of La Rochelle. The Cardinal has his share of political enemies; it stands to reason that they view him as a threat. • THE LADY OF LA ROCHELLE: A complete adventure of espionage, intrigue and of a diplomatic mission to La Rochelle during the siege of the city. • THE ROYAL HUNT: A adventurous outing to the King's hunting lodge at Fontainebleu where subplots abound and the formal activities run the gamut of sporting events and (of course) gambling." • HABSBURG HOSPITALITY: The ambassador, Monsieur de Bienvenu, finds his life in danger in the Imperial Court of Austria. The player-characters must protect Monsieur de Bienvenu, while at the same time avoiding an obvious show of their duties as the sanctity of the Imperial Court must retain the appearance of sanctity. • THE CONSTANTINOPLE EMERALD: An adventure of intrigue and theft to procure a valuable gem in Venice amidst the chaos of the Venetian Carnival. • TORRE DEL DIABLO: A dangerous mission to carry a message to a prisoner in a Spanish prison, and to bring back a reply in writing. Complications will arise as the adventurers must sneak into the prison and find their mysterious prisoner. • THE BINNENHOF AFFAIR: Valuable stolen documents must be recovered for the ambassador while in the Hague. Espionage and deceit complicate matters as the characters encounter a sinister Dutch secret espionage organization. • DIPLOMATIC IMMUNITY: An adventure of intrigue and flight when the international code of Diplomatic Immunity breaks down in England. 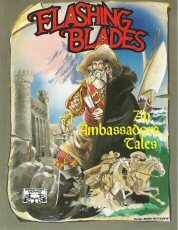 An Ambassador's Tales is a complete campaign of five interlocking adventures for use with the FLASHING BLADES game system. 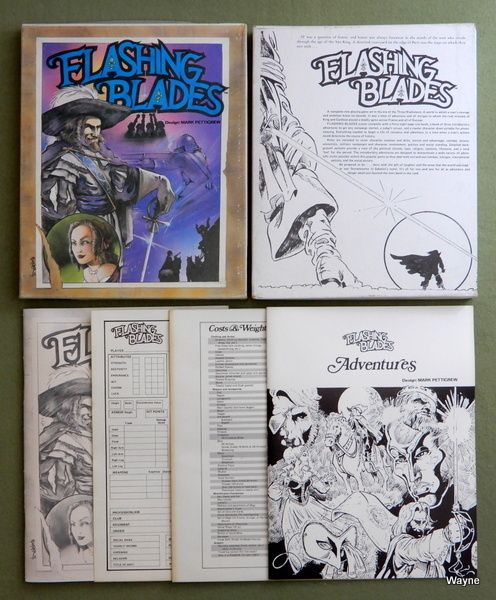 FLASHING BLADES is required for use of this adventure/campaign package."